The 62.5 metre motor yacht Apogee, listed for sale with Thompson Westwood & White and Merle Wood & Associates, has had a $5,000,000 price reduction. Built in steel and aluminium by Italian yard Codecasa, Apogee is Lloyds classed and MCA compliant, with delivery in 2003 and a refit in 2009. Her interior by Franco and Anna Della Role offers extraordinarily flexible accommodation, sleeping up to 18 guests in six to seven cabins including two Pullman berths and a double staff or guest cabin with a further two Pullmans, all finished in mahogany and all with en suite bathrooms. 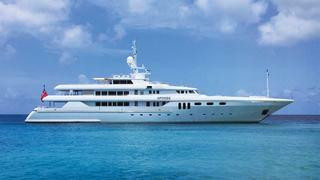 A highly successful charter yacht, she encompasses a great deal in one package. The attention to detail can be seen throughout this yacht for sale, from the magnificently crafted mahogany, burl mahogany and rosewood panelling in the bridge deck saloon, the rich woodwork of the main saloon, the inlaid granite flooring in the foyer, the grand staircase and the elevator. Notable amenities include a large breakfast bar on the main deck aft, al fresco dining on the sky lounge deck aft, and, on the sundeck, a well-equipped air-conditioned gymnasium, 12 person Jacuzzi spa tub and two wet bars on the huge aft deck sunning area. Powered by twin 2,260hp Caterpillar diesel engines, she has a cruising speed of 14 knots and an impressive range of 6,000 nautical miles at 11 knots. Set to be on display at the Monaco Yacht Show 2017, Apogee is now asking $24,950,000.